For some reason or another, there is no early rising this morning. The sense of urgency to get out on the water has wained a bit. As we ate last night’s dinner, grey and gloomy clouds enveloped the lake. Looked like a storm was a brew’n. By lights out the lake’s surface was covered in 2-3 foot chop. Sleep came quickly as the dark clouds cloaked the pesky moon, and the wind howled with a hypnotic rhythm. When we finally rose for the mornings “rituals” the wind had abated, but the lake’s surface was still littered with ridges that made a boat ride less inviting. Pancakes and bacon beckoned, a summons we accepted. Breakfast was followed by a round robin of cribbage, some light reading and cabin chores, accented with a round or two of Toasted Caramel whiskey, all in an effort to at least feel busy doing “nothing” while we waited and hoped for the weather to improve for us to be enticed outside The problem is that we have been spoiled with fantastic weather and water conditions, so anything short of slick glassy water was “unacceptable”. As if on cue, and at the moment complete boredom was starting to raise it’s ugly head, the lake surface “relaxed”. To “change” things up, we switched up the boats. Paul would fish with his cousin Sparky and I would fish with Mike. 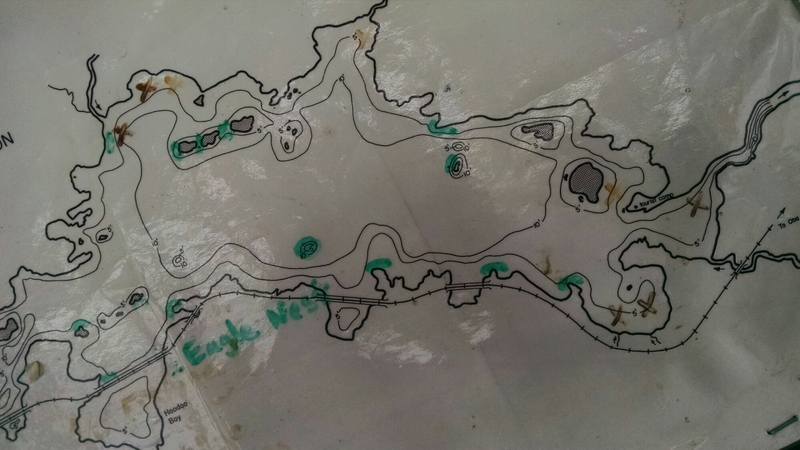 Last night while doing our best to assist with the filleting of our cabin mates and my parents catch (this consisted of me rinsing fillets as Paul pumped the water) I noticed a map of the lake with colored marking nailed to the fish cleaning enclosure. The green lines appeared to indicate where to “find” walleye, and the brown where to “find”, or in our case avoid, pike. Figures it would be the next to the last day that we would notice/discover this. This “treasure map” would have been useful yesterday! We mention this morning that we should make it a point to hit all those places we saw on the map that we haven’t fished yet. We wonder if our host has a copy of that map, and ponder what we should do. Ah, use the cameras on our phones, duh! Why this took so long for us to come up with this, is why our children roll their eyes at us when we discover a “new” feature on our phones, or rip it out of our hands when we are attempting a “long” text, and fininsh it for us. For Mike and I, our plan is to find and land a bigger fish than Sparky. So far, his first day, first hour walleye is the “tournament” winner. Everyone in camp is rooting for someone, anyone, to bring in a bigger fish than Sparky. Mike and I discuss the possible use of rocks to “enhance” the weight of a nearly similar size fish. We hit the water and it’s Fish On! in a matter of minutes. We let that one go as it does not meet our minimum size limit of 16 inches. We refer to our map and try out a new area. We drift past the areas assigned “green” with Walleye and are not impressed. We spy a cove and drift past its point and WHAM, a 22 incher. We have found the spot, and it is NOT on the map (nor will it get on the map). We drift again and again. It reminded me of going to the fishing convention shows with my dad when we were little and they would have these onsite fishing ponds with fish “trained” to hit your “fisher price” set up. For the sake of being “sporting”, we decided to bring it in and find the others and see how they were doing. Apparently not as good as us, but they weren’t fishless. This lake would be awesome with a sweet suped up bass boat. Imagine cranking up the motor, flipping our hats backwards and racing at ridiculous speeds to spot after spot after spot. You’d have to make up spots. With only two fish left to fill our days’ limit, we decide to try our luck at finding the allusive perch that are said to also dwell in this lake. 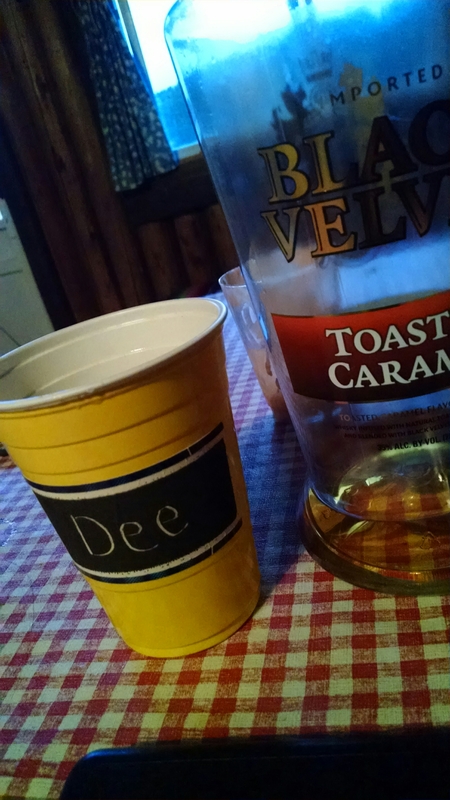 We find the bottom a little too snaggy and ditch that idea in favor of moose hunting. There are several rivers and streams that feed into and flow out of Oba lake. We find one whose opening has lilly pads lining the “river’s” edge. We snake our way gingerly up the narrow river passing massive beaver lodges. We get drawn deeper and deeper into the “abyss”. No sign of moose. We are suddenly aware of how still our surroundings have become. The quiet putter of our 9hp engine breaks the eerie silence. The skies start to cloud up again. Mike starts to get a little worried and wants to turn back. No one knows where we are, and if the motor craps out on us, or we actually find a moose (or a bear) and they are not happy about being discovered, it will be a long paddle back to camp…for one of us. The adventuring side of me wants to continue, but the Murphy’s Law “app” in me sides with Mike and we turn back. We head back to our honey hole and fish like the fools we are till it starts to drizzle and we are satisfied with our catch for the day. Nothing that will win the ‘tournament”, but some damn Nice Fish. We return triumphant with a full stringer and retreat to the warmth of our cabin. Paul and Sparky are already in, as well as my parents. Mike hastily and with the finese of a neuro surgeon fillets our catch for tonight’s fish dinner. Tonight we prepare fish tacos and eat until we are past “thanksgiving full”. One more day remains to beat Sparky. We have caught all we can bring home, so tomorrow will be catch n’ release until someone lands a “Hog”. 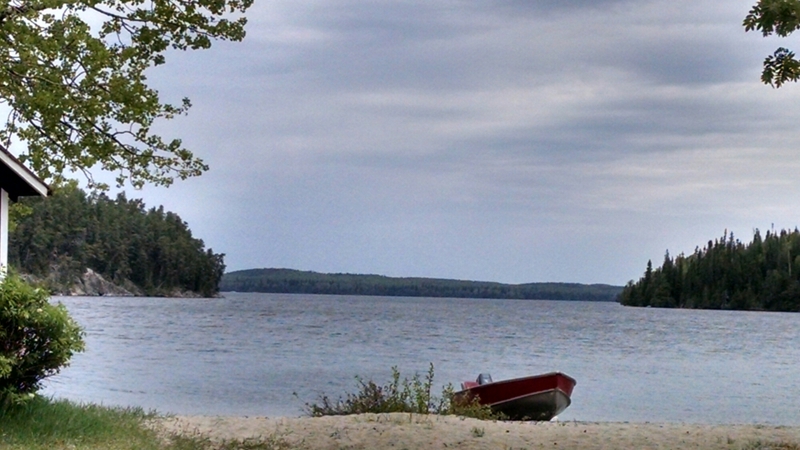 This entry was posted in Mini Adventures and tagged Oba Lake. Bookmark the permalink. What we would give for a cool rain and stiff breeze today in the Southland! Im in Riverside and it will hit 95 easy. Ok catch that winning fish , eh?